Discover first hand the ways in which artists are using shared experiences with food and drink to spark new ways of thinking about the world around us. The following participatory projects and meals take place within the Smart and across Chicago as part of our exhibition Feast: Radical Hospitality in Contemporary Art. Lotteries will be held in advance to choose at random the guests for select projects while others are ongoing or drop-in events open to all. Stage your own meal-performance in the Smart's café using Jaarsma's lightweight sculpture, which is worn by two people to create a mutually supported table surface between them. Available for check-out in the Smart's cafe. Enjoy a spoonful of slatko, a sweet strawberry preserve that is served to guests in Serbia as a traditional gesture of welcome. Theslatko calls attention to the roles of host and guest and will be ceremoniously served to visitors as they enter the Smart a few times each week. Served periodically in the Smart's lobby. Try our interpretation of the original Fluxus score by artist Alison Knowles: "A tunafish sandwich on wheat toast with lettuce and butter, no mayo, and a large glass of buttermilk or a cup of soup was and is eaten many days of each week at the same place and at about the same time." Prepared by Foodism. Just like the plate featured in the galleries! Available for $6 at the Smart Café. Your choice of soup or buttermilk. In collaboration with chefs from Chicago’s Iraqi community, Rakowitz will launch a new mobile iteration of his ongoing Enemy Kitchenproject. A few days each week, the Enemy Kitchen food truck will travel around the city serving a rotating menu of regional Iraqi dishes, with American veterans of the Iraq War acting as servers and sous-chefs. The food will be served on limited-edition, paper reproductions of china found in Saddam Hussein's palaces. Follow @EnemyKitchen on Twitter to find out where and when the truck will be serving food. The collective Red76 is organizing a series of gatherings across the country to eat, drink, and discuss what it means to Occupy. Host your own dinner, document it, and share it with Red76. As part of the exclusive evening preview of Feast, Alhäuser will present a small, elaborate buffet and catering performance based on one of her ornate recipe drawings. The preview is by invitation only. For information about this event, please e-mailruehl@uchicago.edu or call 773.702.2368. Held regularly since 1970, Marioni's famous salon comes to Chicago. Guests are invited gather and drink free beer within a bar-like installation in the Smart's galleries. Marioni himself will help kick off the series at the Feast preview and opening. Guest bartenders include Anthony Hirschel, Dana Feitler Director of the Smart Museum of Art, and Madeleine Grynsztejn, Pritzker Director of the Museum of Contemporary Art Chicago (March 1); Chicago hip-hop group BBU (April 5); poets and teaching artists from Young Chicago Authors(May 3); and theater collective The Neo-Futurists (June 7). Drop-in. Must be 21 or older. Gates is collaborating with chef Michael Kornick and Erika Dudley, an expert on soul food who works with the University of Chicago's Civic Knowledge Project, to host a series of ritualized dinners at Dorchester Projects, a group of once-vacant homes in the Grand Crossing neighborhood on Chicago’s South Side. A diverse mix of curated guests and members of the public will join Gates for five dinners that will combine meals served on specially commissioned ceramics created in collaboration with Japanese master potter Kouichi Ohara, performance, and discussions around a variety of themes: The Geography of Soul (February 19), The Art of Soul (March 11), The History of Soul (April 15), The Politics of Soul (May 6), and The Community of Soul (May 20). * Space is limited to 20 guests, chosen in part by lottery. The lottery has closed; guests have been chosen for the remaining dinners. On the anniversary of Lacy's landmark participatory performanceInternational Dinner Party (1979), the artist and the Smart Museum invite you to host a dinner party that honors a woman in your own region. For the original performance, participants around the world sent Lacy telegrams, letters, ephemera, and photographs to document their dinners and share their stories. This time, we invite you to share your stories and photos on Facebook, upload photos to Flickr, or e-mail or mail them to us. Three guests, chosen by lottery, will have the opportunity to dine with Lee in the Smart's galleries, after hours, within an elegant sculptural installation. The artist will prepare the simple meals himself. Similar encounters between artist and guest will be shown in an abstracted form within the installation during regular museum hours. This will be the first time that The Dining Project—which was first presented in 1997—has been staged in Chicago. * Limit one person per dinner. A lottery was held to randomly select participants. Building on her classic 1960s Fluxus scores, Knowles will conduct performers who will use blenders to mix the components of her habitual lunch—a tuna fish sandwich with butter and lettuce, no mayo, and a cup of soup or glass of buttermilk—which then will be served to the audience. This is the world premiere of the performance. Presented as part of the Feast symposium. In Feast, the artist collective Fallen Fruit explores the essence of place through a display of vodkas infused with fruit gathered in Los Angeles. At the Feast symposium, the vodka will be served while participants share stories about their own neighborhoods. Initiated by InCUBATE and documented in Feast, Sunday Soup returns to Chicago! The quarterly meals—organized by InCUBATE, Roots & Culture, and others in the Chicago art community—generate funds for artist initiatives and community projects. $15, tickets are available at sundaysoupchicago.org. Join Andi Sutton and Jeremy Liu of the National Bitter Melon Councilfor a Bitter Melon-based lunch, presentation, and conversation about applying Bitter Melonism to the context of Chicago. Free. RSVP to the NBMC at andi.sutton@gmail.com. Examine ways that innovative agricultural and culinary projects assert new understandings of spaces, ideals, tools, and relationships during the salon Rooted: Food and Farming Initiatives as Regional Artwork. Grab a piece of ice cream cake before heading into the galleries for a last look at Feast before the exhibition closes. The afternoon party features special cakes designed by Robbins that update and celebrate the American tradition of the ice cream social. 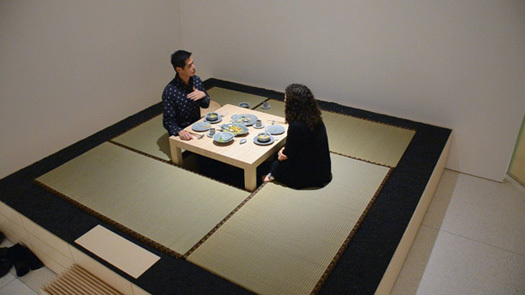 Lee Mingwei, The Dining Project, 2012, documentary photo of performance at the Smart Museum of Art. Courtesy of the artist and Lombard-Freid Projects. Photo by Steve Rosofsky.